ScriptClips is an online database that catalogs thousands of sides & scenes from contemporary TV/Film and makes them readily available with simple keyword search. Sign up for FREE today and discover how ScriptClips can help you find the best material for your workshops and classes. Sign up for a free account and receive immediate access to studio libraries. 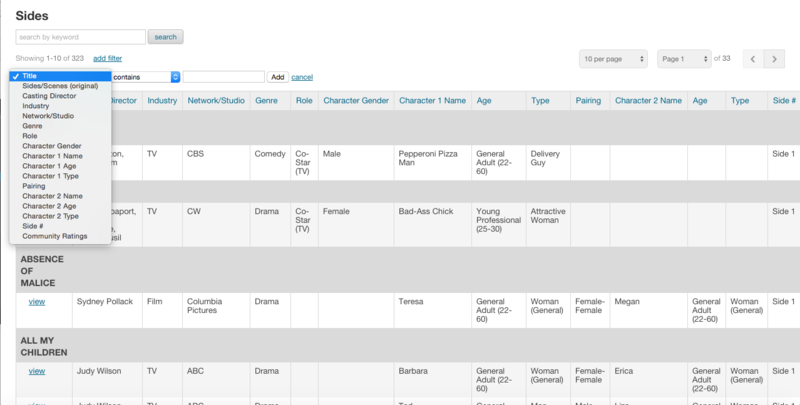 Ask your favorite Acting/Workshop studio to join ScriptClips so you can access more free sides/scenes. Purchase a membership and access thousands of sides in our Community Library! Check out our blog to learn the best ways to find the sides you're looking for! We've joined with the top workshop/acting studios in the industry to provide their studio libraries fully cataloged for their workshop participants. Create your own personal library by uploading and cataloging your own sides & scenes. You can also bookshelf the sides you find and love on ScriptClips, so you can locate those favorites anytime in the future. Get access to a huge community library filled with thousands of sides & scenes, with new sides uploaded regularly! Find sides & scenes that fit YOU in seconds! 3) Save favorites to your library Bookshelf, so you can easily locate them anytime in the future. How to use your personality to propel your acting audition! How to use your acting ‘type’ to your advantage! ScriptClips is an online database that catalogs thousands of sides & scenes and makes them readily available with simple keyword search.